Cactus and Succulents forum: What's interesting at my place today. Unknown Yucca flowering. Pity I can't set seed on it. The only way to succeed is to try. One of my Cereus seedlings flowered overnight. Still a bit cool here for this time of the year. Am really pleased with the intergeneric hybrid Cereus NOID x Echinopsis hybrid. It flowered twice last year, as a two year old, this year however flowering may be a memorable event. Noticed what I think highly likely to be developing flower buds on the local Mistletoe. Looking forward to seeing whether I'm just dreaming. Yellow spots near what I think may be developing flower buds. Pity the Camera isn't fitted with a Flash. Annually Wood Ducks as I call them, they nest in trees, pay me a visit. This year they must have been carrying a payload. Noticed today the reed(?) is starting to produce flowers. The Azolla is dying back but the Bacopa has started to grow over the past week. You live in australia , right? Do you have any of the invasive harrisa? skopjecollection said: You live in australia , right? Do you have any of the invasive harrisa? Best to follow the link, https://florabase.dpaw.wa.gov...., and use the search facility, it will provide you with more info than I have. Some trees in one of my windbreaks, started flowering not long ago. In full bloom now, standing near them makes you think you're in the midst of a swarm of Bees. Luckily many years ago I was involved with Beekeeping, so Bees don't worry me a great deal. ---You're right it is grafted. The parent Echinopsis hybrid, see https://garden.org/pics/2018-1..., flowered last night. ---Cereus NOID, this is the other parent, a Cereus of unknown parentage. It has a flower such as you mention as being for a true Cereus, and no, it is not the rootstock. Echinopsis is in the trichocereae tribe, cereus is in the cereae tribe. No hybrids exist.. The other parent looks like a Cereus and as far as I'm concerned that's what it is. The seed which resulted from the cross had two which germinated, one was not viable in the long run, the other is what I have posted. Think you may find this link of interest, https://www.bbc.co.uk/programm... and in particular the Multiple Genes episode, interesting. The whole series is particularly interesting as far as I am concerned. "The other parent looks like a Cereus "
To my knowledge, at least 10genera possess plants that look like cereus..
On the list which species hybridises with the Hylocereinae? None. Hylocereniae (disocactus(former aporocactus), epiphyllum, hylocereus, selenicereus,weberocereus and psedorhipsalis )dont form hybids with other plants..
skopjecollection said: None. Hylocereniae (disocactus(former aporocactus), epiphyllum, hylocereus, selenicereus,weberocereus and psedorhipsalis )dont form hybids with other plants..
Scion is a hybrid, the result of a cross between what is highly likely to be C. repandus and a member of the Hylocereinae. The scion has now been de-grafted after the fruit was not up to my standards. Last season there were fruits set between the C. repandus and the scion and vice versa. Admittedly the fruit resulting from the C. repandus x scion was smaller than that using other clones, the reverse pollination produced a good size fruit. The C. repandus is not self fertile. It will only be a few days before the echinopsis scion flowers, keep an eye on the thread and you can compare the flowers with that of one of it's parent's. This will be my last post on the topic, more important matters need my time. So, at risk of getting involved in this, I have to ask for a clarification. Like Stefan says it looks like you grafted an echinopsis (or Trichocereus) cutting to a Cereus - your C. noid. The Echinopsis flowered and set fruit and you think that fruit contains seed that is of hybrid origin between the Cereus and the Echinopsis grafted onto it? 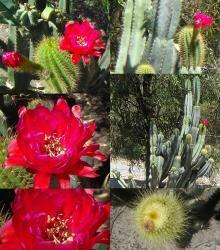 If so, my question is - how do you know that the Echinopsis flower was fertilized with pollen form the Cereus flower? Did you do it yourself? If not how can you be certain that a sneaky bee, or other insect, or any kind of local interested pollinator, did not pollinate the plant with pollen from another plant in flower at the same time that was potentially more compatible or if it may have self pollinated, which is not completely unknown among some Echinopsis species. I do not know if Cereus x Echinopsis hybrids are possible. I am inclined to think no, because I would have expected there to be oodles out there to try and make Cereus sized plants with brightly colored flowers. 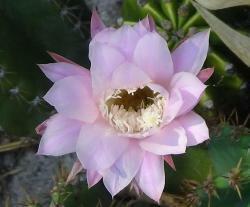 The whole reason people started hybridizing Echinopsis/Trichocereus/Lobivia/etc in the first place, was to create larger plants readily flowering plants with brightly colored large flowers, Cereus would have been the obvious target as a hybridizing partner in terms of overall plant size and flower size, if they were compatible. If not, I do not understand how you can think you have acquired something that is a hybrid between Cereus NOID and the grafted on Echinopsis? If the Echinopsis produced an offset on its own stem, then that is just another Echinopsis hybrid of the same kind genetically identical to the plant that produced it. If you graft a plant on another plant the plant it is grafted on takes care of the scions needs as in water and nutrients, but their genetics do not automatically mix unless you successfully produce viable seed from cross pollinating between the flowers of the different species, but unless you did that in a controlled environment you have no way of knowing if those two plants actually were crossed with each other. Sorry if this is all really basic to you, but the discussion here got really confusing to me. mcvansoest said: So, at risk of getting involved in this, I have to ask for a clarification. If so, my question is - how do you know that the Echinopsis flower was fertilized with pollen form the Cereus flower? If not how can you be certain that a sneaky bee, or other insect, or any kind of local interested pollinator, did not pollinate the plant with pollen from another plant in flower at the same time that was potentially more compatible or if it may have self pollinated, which is not completely unknown among some Echinopsis species. - Flowers are restrained from opening with rubber bands which are re-applied following the pollination. - Sowed seed after collecting it from the dried fruit. - In summary I follow normal breeding protocols. Have two A. americana quiotes coming up, will remove them shortly. Have eaten portions of one in the past, a bit bland.